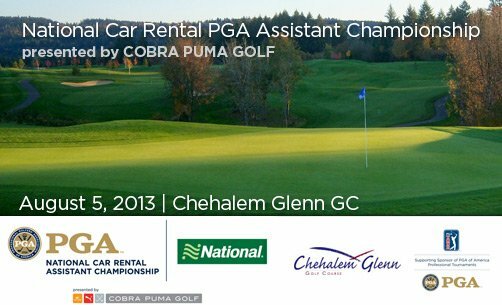 National is now accepting entries for our National Car Rental PGA Assistants Championship presented by COBRA PUMA GOLF at Chehalem Glenn Golf Club on Monday, August 5. We will play 36 holes. Entry deadline is Tuesday, July 23 at 2:00 PM. Please pay close attention to the entry deadline for this event. Every year at least one of our assistants gets confused misses the deadline… please don’t let this happen to you! CLICK for the unofficial National Car Rental PGA Assistant Championship entry. Last year, Brad Faller of the Reserve Vineyards GC won the National Car Rental Assistant Championship presented by COBRA PUMA GOLF at Fairwood G&CC. He won by five strokes over Mike Roters of Gateway Golf, Russell Grove of Avondale GC, Brian Nosler of Vanco Driving Range, Colin Inglis of Springfield CC, and Tim Feenstra of Broadmoor GC. In addition to Brad Faller, both Mike Roters and Tim Feenstra earned spots to the 2012 National Car Rental PGA Assistant National Championship presented by COBRA PUMA GOLF at the PGA Golf Club in Port St. Lucie, Florida last November. See you Chehalem Glenn Golf Club!